The singing entertainment sensation and crowd favorite miss Anne "Annebisyosa" Curtis in her 2nd solo concert entitled "No Other Concert" which will be held on March 23, 2012 at the Waterfront Hotel and Casino, Cebu. Anne will once again entertain her fans not only in Manila but in Cebu where she's one of the most promising singer and at the same time a great entertainer in her era. Let's welcome her with full support, facing her fears and chasing her ultimate dream that nearly come, the likes of Lea Salonga, Charice Pempengco, Sarah Geronimo, and many others. I was one of a fan to her greatness, with respect to profession, she is a multi-talented individual living here in our Philippines. As Cebuano people, let us support her 2nd solo concert here in Cebu at Waterfront Hotel and Casino. Dated way back November 2011, Anne Curtis was in Cebu to promote her first album entitled “Annebisyosa,” at Ayala Center Cebu and was successful on her “Annebisyosa” concert. After her successful major solo concert which was the "No Other Concert: Annebisyosa Live! World Tour" that made the whole Smart Araneta Coliseum fans crowd dated last January 28, 2012, where her guests were younger sister Jasmine Curtis-Smith, best friend Luis Manzano, Vhong Navarro, Showtime co-host Vice Ganda, ex-boyfriend Sam Milby, No Other Woman co-stars Cristine Reyes and Derek Ramsay, and Sarah Geronimo. It was a very shocking and nerve wracking concert, afterall, a huge success to her first solo concert. 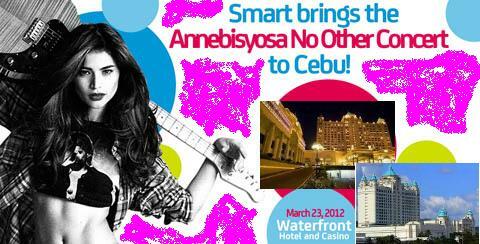 Now this March 23, 2012, Friday, the “Annebisyosa” concert held at Waterfront Hotel and Casino at 8 p.m. Watch Anne Curtis there! Be live! Be entertained! Ticket prices are at Php2,200 for Gold A, Php1,700 for Gold B, Php1,200 for Silver, and Php700 for Bronze. For ticket purchases, you can check out @ http://www.yescebu.com/. More updates soon for the news, photo, video replay of Anne Curtis "Annebisyosa" concert in Waterfront Hotel and Casino, Cebu.